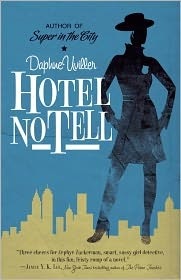 Daphne Uviller’s novels (SUPER IN THE CITY and HOTEL NO TELL) manage to be at once both smart and hilarious. If you haven't read them, you should do so. Right now. Not only is Daphne herself both smart and hilarious, she has tackled for Blurb Is a Verb the eponymous subject which terrifies so many authors (including me): Blurb Acquisition. You’re scanning books on the New Arrivals table of a bookstore (in this scenario, the end of civilization as we know it hasn’t yet arrived). You rapidly pick up and put down volumes, your neurons going slightly haywire over how to make sense of the crowd of titles begging for your attention, each of them desperate to take you out to dinner and a movie, maybe get to second base if you’d only give them a second glance. Are you the type to be seduced by a cover? A first line? Do you go the Biblical route, letting the book fall open to a random page, and wait for soulful connection to leap forth? Or do you read the blurbs? Really? Huh. Tell me now. Is it the name of the blurber that attracts you? Or the title of her own book? Is it the phrase “New York Times bestseller” next to his name? Surely it isn’t the actual blurb itself. You don’t actually get around to reading that, do you? Tina Fey is famous enough that she could afford to mock the entire blurb phenomenon on the jacket of Bossypants (“Totally worth it.” —Trees) and, like the rest of that book, she carried it off with self-deprecating humor. But the rest of us must use every last tool in the shed to promote our books, and the process of self-abasement begins long before your book jacket is even designed. You’re sitting with your editor at a midtown Manhattan restaurant and you’re just so excited that someone is paying for your lunch and that you can say things like “lunch with my editor” that you don’t think to dread the awkward conversation about to unfold. You’re each armed with a list of potential blurbers. On yours, some are friends who have published books who will almost definitely do you this favor; some are biggish names that friends of yours might ask on your behalf; and some are pie-in-the-sky reaches. Yes, it’s your college application process, relived in all its horror. So Hotel No Tell is blurbed entirely by kind friends: Jenny Nelson (author of Georgia’s Kitchen, which I blurbed) was well-matched to my book in terms of genre. Then I have Janice Y.K. Lee, who managed to complete her New York Times best-selling novel The Piano Teacher in small part because I made her meet me for writing dates, so I think she felt obligated. I’m extremely proud of my books, but I bet Janice was a little embarrassed. My publisher put her blurb on the front cover. Then we alit on new territory: Hollywood. I remembered that I have friends who have written movies, funny movies. Movies that were actually made and released. Hey, this was interesting... And so, to my great delight, I have a perfect blurb by the writers of Dinner for Schmucks. These kind, talented men were, not to put too fine a point on it, fresh meat. That is, not too tapped out by dozens of previous requests to groan at mine. I think, I think, they actually enjoyed the task. Years ago, after she’d established a rock-solid writing career but before summiting the Everest that was Eat, Pray, Love, Elizabeth Gilbert promised me, “If you write a novel, I will blurb it. Remember that when you need incentive to keep working.” I finished my first novel just as the world was in the midst of its EPL frenzy. I gave Liz the option of backing out of her promise, telling her I understood that her name was now a commodity to be protected. Forty-eight hours after she received the manuscript, she e-mailed me her blurb. My agent was able to put it on the manuscript of Super in the City before we sent it out to editors. It was rejected by seven houses before it was accepted, but I’m convinced that her blurb got my manuscript to the tops of editors’ piles. There are writers known as “blurb whores” – people who will blurb just about anything with pages, and I think this is an outrageous stigma. What these generous people are doing is sharing their fame and good fortune, trying to extend it to help you, the newbie writer. I hope one day to be well-enough-established that my skimmed name and praise on the back of a book jacket would be of some help to another writer. Sarah: Thank you Daphne! Can I ask you a question? If you could ban any three adjectives from all future book blurbs, which ones would you choose? Daphne: "Thoroughly enjoyable," "entertaining." And "readable." Because they damn with unoriginal praise. Sarah: Ah, yes. Sort of like calling a wine "drinkable." Although... having a glass of drinkable wine while asking for blurbs is probably a good call. Oh my goodness, Kim! Maybe there's a special circle of hell for reviewers who make stinging personal attacks. Excellent post...I'll have to remember this for my next book! Groucho Marx once said about S J Perelman's book, Dawn Ginsbergh’s Revenge, "From the moment I picked your book up until I laid it down I was convulsed with laughter. Someday I intend reading it." - Has there ever been a finer blurb? Dave, I like this one, by Dorothy Parker: "This is not a novel to be tossed aside lightly. It should be thrown with great force." It's interesting to hear the story, because I admit I was intrigued when I read the blurbs on the covers of both SUPER IN THE CITY AND HOTEL NO TELL, wondering how those blurbs came about. I HATE that one of my publishers makes me grovel for blurbs. And even if you manage to get a "ok" from an author, they're just as likely to become too busy when the actual deed has to be done. And then you wonder if it's because they really ARE too busy, or if they've read some of the manuscript and don't like it. The easiest blurb I got was from an author who said, "sure, put something together and I'll tweak it." Which then, of course, made me suspect all blurbs. I agree that authors who are always willing to blurb should be celebrated and thanked for their willingness to share their success with others, not reviled. I have recently been the beneficiary of exactly this kind of generosity (to a dazzling degree) and I will be forever grateful to the kind writers who took the time to help.